Super Hero Boy: Bring a robot home! If you haven't been paying attention to my obsession with robots the logo for Prizeatron might have tipped you off regardless. I have two great loves wooden toys and well Robots and I know that seems awfully conflicting but I don't at all as robotic toys are most children's first introduction to technology and whats humans are truly capable of creating. I've been watching Wowwee's line of robotic toys since the very first Robosapian. Actually I once took Connor's uncle Jeremy's Robosapian hostage for two months in hopes I could hijack my favorite video game of all time from him. heh. It worked and I finally let the Robospian go free but our two months together really gave me a new perspective of what a family friendly toy robot should be.. unique, affordable, and engaging. All of the Wowwee robots I have tested thus far have all done just that. Each one captures the imagination in a new way and compared to the technology involved they are all very affordable not to mention incredibly entertaining! 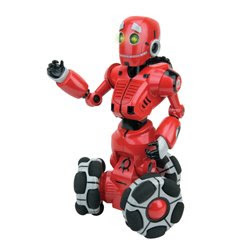 The new Wowwee Tribot is the most mobile of all of the Wowwee robots we have had our hands on. His three wheel navigation system for which he is named allows him to navigate the house quicker than all of his older cousins and spin in a full 360 which is a unique feature. The tribot's new face is also the most expressive of all the other Wowwee robots we have tested. His eyebrows go up and down, he has panels on his head that blow open when he is excited, his eyes and mouth glow and blink when he is excited or talking, and of course there is that flashlight in his head that pops up. Talk about unusual the Tribot is the most talkative of all the Wowwee robots we have seen thus far, so much so he has something to say about everything. Falling down, spinning in circles, something moving in front of him, he has a little something to say about almost every situation. In fact you may just call the Tribot a mini comedian on wheels. This makes him the perfect companion for kids and unusual in the fact that I think so many parents associate robots with the "battle type robots" that are so common these days. Though this guy does feature a guard mode there is nothing even remotely aggressive about this robot. He's just ready to have fun any time you are. Tribot is available right now over at the Wowwee Robotics website. He is easily one of the hottest toys of the year so I wouldn't wait till the last possible second to pick one up if your looking to get him for Christmas.